A couple of months back a package arrived at the door, containing not just four wines from the Alpha range of consistently good Chilean producer Montes, but an MP3 player, headphones and a pre-loaded selection of music. Not, as you might think, a grossly obvious case of bribery and corruption, but rather a chance for me to try out some wine and music pairing suggestions, which have emanated from research funded by Montes, and carried out by Heriot Watt University in Edinburgh. The research was aimed at discovering what impact – if any – listening to different types of music had on the taste perceptions of wine drinkers. Professor Adrian North of the university’s Department of Applied Psychology tested the theory of ‘cognitive priming’ in his studies, looking for evidence that music could ‘prime’ specific areas in the brain to perceive aromas and flavours in different ways; that music could directly influence our taste experiences. Montes’ interest in the subject was sparked by winemaker Aurelio Montes, who plays monastic chants to the maturing wines in his barrel cellar, and who even took acoustics into account when designing the amphitheatre-shaped room. Professor North found that subjects sipping Montes Alpha Cabernet Sauvignon whislt listening to a powerful piece of music like Carl Orff’s Carmina Burana, perceived it to be 60% more powerful than when tasted without music. And so to my trials of the music and wine pairing suggestions sent through by Montes. First up was a blast from the early 80s in the shape of Blondie and ‘Atomic’. The suggested wine match? 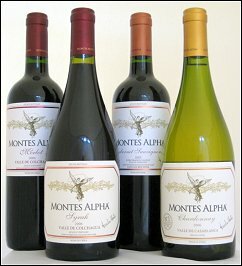 The Montes Alpha Chardonnay. For me the pounding disco beat and rippling synthesiser didn’t do much one way or the other for the wine. Track two on the other hand, Otis Redding’s soul classic ‘Sitting on the Dock of the Bay’, was the perfect smooth and languorous accompaniment for the Alpha Merlot, which emphasised its smoky oak and dark-fruited richness. 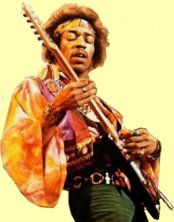 The whole experiment was great fun, and the other suggestions – Jimi Hendrix’s classic ‘All Along the Watchtower’ with the Alpha Cabernet and Pavarotti powering Nessun Dorma into surrender with the Alpha Syrah – both altered the perception of the stuff in the glass perceptibly. But then I don’t know if I really needed Professor North to tell me that: it seems pretty obvious that music can affect one’s mood and feelings. Why else would the writer’s of film soundtracks win Oscars and get paid a fortune, and why else would lovelorn teenagers lock themselves in their bedrooms, comforted only by the sounds of Radiohead or Coldplay? So just to be on the safe side, my tasting notes on the current crop of Montes Alpha wines were written without the aid of musical stimulation: I wouldn’t want Debbie Harry or Jimi Hendrix to put words – and flavours – into my mouth, now would I? Like all of the wines in the ‘Alpha’ range from Montes, this is fairly massive stuff, though never tipping over into excess. From closely-planted, low-yielding vineyards, and aged for one year in French oak, the nose leaps from the glass, redolent of blackcurrant, juicy, kirsch-like black cherry and a wonderfully peppery, spicy, cedarwood, vanilla and leather components that adds layers of interest. On the palate this is tight and very densely fruited, with a great, solid core of bittersweet black fruit, and a big mouthful of charry oak and spice, and sinewy tannin. Becoming quite chocolaty in the finish, this is young wine that currently demands food (what a fantastic barbecue red if the £11 price tag allows) but it will come together and become smoother and more integrated with two or three years in the cellar. 90/100. £10.99, Tesco, Waitrose. There’s a hefty 14.5% alcohol in this heady Alpha Merlot from Montes, which overflows with Sandalwood and cedar, brambles and rich autumnal berry fruit. Twelve months in new and used French oak will account for some of that spiciness, and 10% of Carmenère in the blend adds some fruity gloss. On the palate the hedonism goes on, with a wash of rich, ripe, intense black fruit flooding the palate, but all the time that cedary, smoky quality is layered beneath, The tannins are noticeable, but ripe and thick, and lead on to a long finish with moderate acidity allowing the wine breadth and a certain plushness. 89/100. £10.99, Co-op.